Discussion in 'other anti-virus software' started by Lawliet, Sep 3, 2008. What is "response times to outbreaks"? Panda and BitDefender response times their response time new edition and the old edition result is different. The time it takes to add malware to the databases. Clam Antivirus did very good in this test. Yup it's the same stuff. Norton has an impresive update rate. The most interesting data to emerge from this measurement was that the 2009 version of Norton topped the table with an impressive 6,202 incremental micro-updates, issued several times per hour, while Kaspersky came a distant second with a mere 696. Half of the 34 products tested had fewer than 100, including those from McAfee (21) and Trend Micro (30). It's nice to see Norton becoming like it used to before it became bloatware. they keep this up there position as market leader will be in stone. I think this test is flawed. Installed f-secure 2009 antivirus on my infected pc and all it detected and cleaned were cookies. Not the malware. All the tests are flawed, Splicer. They can only give the user a fairly good idea, over time, of what the success rate is against known threats, how quick the AV is to respond to new threats, etc. This one seems to me as good a guide as any. All your "test" (if it was a test) says is that f-secure doesn't have the ability to deal with the particular malware you have. And if it's not a test, better get yourself an antimalware that can clean it. [Edit] just read your other three posts. Confirm you uninstalled Nod32 before installing f-secure? Start another post about your malware problem at "malware problems and news"
is there anywhere in the results that show how well the programmes remove the malware? but Bitdefender 2009/2008 db has differently too? 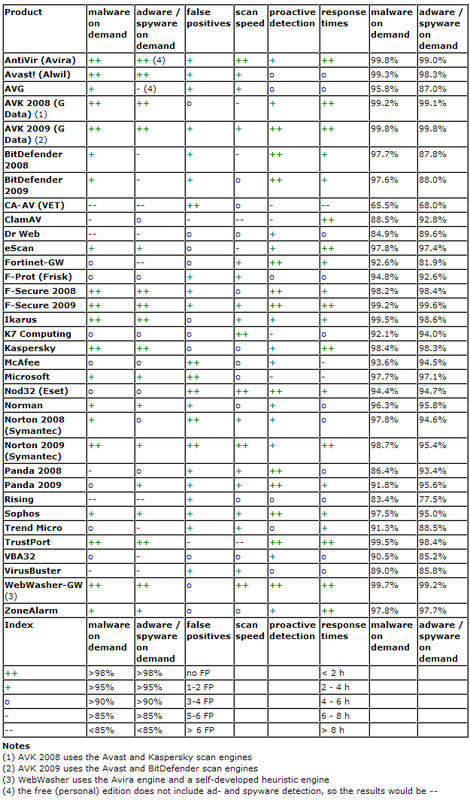 From the article: "Independent testing body AV-Test.org has released the results of a major comparative of suite products, with many vendors' 2009 editions included in the results." So, this is a suites test and not a stand-alone AV test? I don't see how you can come to that conclusion It did OK, but not very good. ClamAV, DrWeb, F-Prot and others have no suite available. So, no, not all of them are the suite version. It did oke? You mean it did terrible... The only thing good was the response times. I guess I'm a little disappointed in OneCare's showing. Since last year, they supposedly gobbled up some serious talent from competing companies. While their score isn't horrible (their detection scores are pretty good in fact), I expected better. They REALLY need to do something with regards to proactive defense and response times. They focus on marketing and sales. Boutique AVs companies have grown because of their indifference. I have read many posts on this site alleging that Microsoft is going to get great test scores, vastly improved heuristics, etc. I have stated several times that is all bs as the proof is when they decide to actually do it. "ClamAV 0.94, the open source anti-virus scanner promises a higher detection rate thanks to new virus scanning abilities. An Enhanced Detection Engine (EDE) now supports logical signatures, which allows the signature database to be contain signatures which are combinations of other signatures joined AND, OR or NOT. This should allow for more flexible pattern matching to catch complex malware. Also added to the EDE is a Disassembly Engine which allows the scanner to examine the bytes within a virus code to help in the detection of encrypted malware. Scanning is not the only enhanced element in ClamAV 0.94. A new Data Loss Prevention module has been added which is used scan incoming and outgoing data for signs of personal identity data, for example social security numbers or credit card numbers, and alert the user to these attempts. Other improvements include better PUA ("Potentially Unwanted Application") detection, more control off the anti-phishing engine by allowing users to tune it, enhanced scanning of scripts and IPV6 support for the freshclam updater." I just wonder to what extent detection will increase. Their scores ARE pretty good (4s in both virus detection and spyware detection) in several categories - Its not all BS. The problem is their focus on signature detection alone. Signature-focused detection + slow response times = Bad protection for zero-day attacks. Once again, Rising performed poorly, but I'm still using it because it seems that the vendor really wants to improve this software. After updates over the past few days, Rising seems to be a bit more aggressive. 1) Avast: nice job, but your "proactive detection" and "response times" need improvement; these have been my only reasons for not running this software on more of my systems. 2) BitDefender: the only improvement in the 2009 release appears to be slightly faster scan times; I see no reason to upgrade. 3) F-Secure: keep up the good work, but LOWER YOUR PRICES!! 4) Rising and VBA32: keep improving; you're on the right track. 6) Dr. Web: another "also ran" performance. This is just another reason you have been repaced by Avast on two of my systems. 8 Antivir: another gold star review. 9) AVG: try to catch up with Avast.